Quality training by AIIC Certified Instructors with over 15 years of experience in Intradermal Cosmetics and Medical Aesthetics. Our online courses include theory, videos, PowerPoint presentations, demonstrations, and much more. Join us for hands on training, one on one training available, and specialty training available. 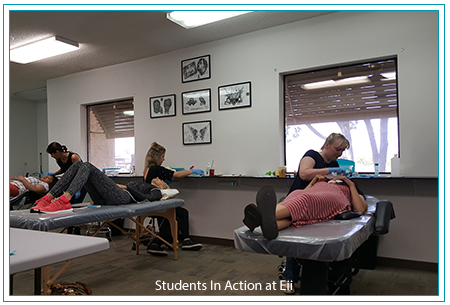 Eii is insured, bonded, and licensed as a Vocational College. TRUST THE PROFESSIONALS AND A SCHOOL THAT IS LICENSED! A perfect introduction to Permanent Makeup, Tattoo Removal, and Tattoos. Class is taken online and is not a clocked hour program. 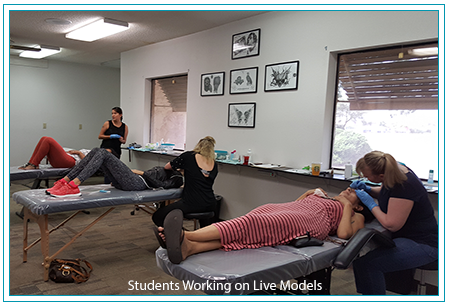 Course covers history of micropigmentation, basic sanitation in the tattoo industry, needles, machines, basic anatomy & physiology. Course is to teach you the safety measures of micropigmentation and beginning knowledge of the industry. Learn how to do Traditional Eye Brows, Traditional Eyeliner, and Traditional Lips. 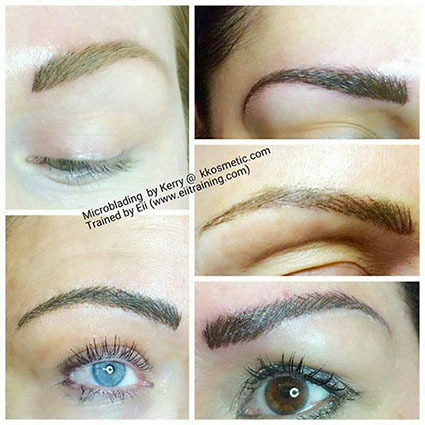 A perfect introduction to Permanent Makeup. Class includes home study and 1 day of class study. Includes practice with inks and pens on simulated skin and live demonstration. You will graduate with a Certificate of Completion. This class has no hands on live model training. Learn how to do eyebrows 4 different ways. (Including Hair Stroke Technique), Eyeliner 4 different ways (including Designer eyeliner technique), Lips 3 different ways (including Faux Lips Technique). This class is packed with training, information, and includes Hands On Training. You will be working on live models for 2 full days. Class includes home study and 3 days of class study. You will graduate with your AIIC Certification as AIIC Basic Intradermal Cosmetic Technician. Learn everything you need to know about Permanent Cosmetics! Complete specialty course that gives you PROFESSIONAL TRAINING. This training includes basics, advancing to advanced procedures, advancing to Paramedical procedures, advancing to correcting permanent cosmetics. Course includes many programs on the market all in one class to save you money. Course is full of information and training and opens up the possibility of many wonderful things in the industry. 100 hours of training, lots of education & hands on training packed into a short amount of time. Includes Basic Marketing and Portfolio Building to help students get started. Includes class supplies and Eii Certificate (which is required by state and insurance companies, doctor offices, and other professional occupations). Class is offered with home study (we give you the supplies and books to study at home) or you can take it online – self paced (replaces book study and includes videos). You come to the school for 5 days hands on training on live models. Student brings models. INCLUDES BASIC STARTER KIT. Charge professional rates. Increase your services to offer your clients or start your own business doing Permanent Cosmetics! Work in spas, salons, doctor’s offices, medical spas, or start your own business. 100 hours divided up into online training, homework, assignments, and class time. After 3 days of enrollment, your online access will be emailed to you to begin your course. You will study at home online or you’re welcome to study online in Eii’s Computer Lab, course is self-paced. We offer email customer support and phone support is available Monday – Friday 8:00 am – 4:00 pm Arizona time. Upon completion of online class study which includes review, practice with PMU pens and inks, equipment use and maintenance tips, educational videos, PowerPoint, and more. Course includes anatomy, physiology, blood borne and sanitation training (certificate is extra), and specialty training in the areas below in blue box. This class includes hands on training for 5 days, which will have refreshed theory, tips, and working on live models. Learn the newest technique of Stardust Eyes. Learn how to safely apply a smoky look to your clients. New technique safely applies multiple colors to give the shimmering look. 1-day course includes online training and 1 client procedure. Learn the newest technique of Stardust Lips. Learn how to safely apply the pouty look to your clients. New technique safely applies multiple colors to give the shimmering look. 1-day course includes online training and 1 client procedure. Learn the newest technique of Ombre Eyebrows. Learn how to safely apply shading of Ombre to the brows. New technique safely applies the shimmering look. ½ day course includes online and ½ day in class working on practice skin. 1-day course includes online training and 1 client procedure. Are you looking to get your Master Certificate in Permanent Makeup? Program trains for excellence, fills in gaps, artist will demonstrate knowledge with proven written exam, practical performance on models, oral exams, and demonstration of qualifications on being a Masters Technician. Program is online and in person for 3 days. Qualifications apply, please call for details. All skin types are different and many technicians restrict themselves to not work on dark skin due to the unknown. This course teaches you the skin types, complications in skin types, color theory, scarring, and more. The course is for beginners and advanced technicians. Advanced procedures that are used in the medical offices, medical spas, and salons. Procedures that helps boost the confidence in your clients! Program begins with online training in hospital and medical exam room set up, sanitation, medical setting, and working in the medical field. Course advances into technical skin complications that prevent or challenges micropigmentation. Skin conditions and how permanent makeup can help the visual effects of the blemishes. Learn paramedical permanent cosmetic procedures for the advanced technician. 3D Areolas, Corrections of the Areolas, Scar Camouflage, Blemish Cover Up, Age Spot Concealer, Stretch Marks, Skinsations, Clift Lip, Faux Lip, and now offering Dermal Rolling, Needling, and more! Learn how to correct mistakes with our Permanent Makeup Correction Class and learn how to remove permanent makeup and tattoos! Two (2) days of Hands On live models training. You will receive a Certificate of Completion and continued education in Permanent Cosmetics. Advance your skills and learn the NEWEST techniques of Scalp Micropigmentation. This class is to be added onto prior experience and is considered to be an advance technique. Price includes hands on training and basic starter kit. 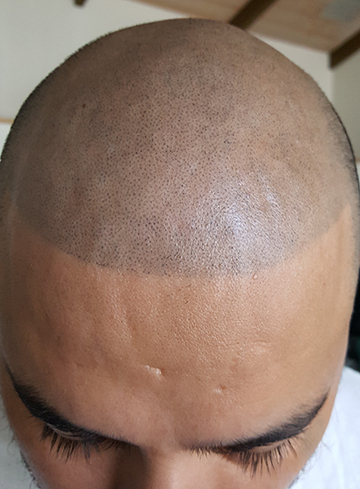 Scalp micropigmentation is an art where pigment is deposited into the hair line with a technique that simulates the appearance of hair. This technique requires professional training and skills to master the effect. With our training, you can master the effect and offer your clients a life changing result procedure. This service is the fasting growing service that is in demand by women and men all over the world. It is the quickest solution to balding. It builds confidence and improves your client’s life. Advance your skills and learn the NEWEST techniques of Microblading (Feather Touch, 3D). This class is to be added onto prior experience and is considered to be an advance technique. Tuition includes hands on training and basic starter kit. Technique is done by hand. Microblading brows has been around for many years, today it’s the world’s largest request by your clients. It is not the traditional hair stroke technique or popular hair stroke technique. This technique is considered Advanced Permanent Cosmetics and the results are done with special training, practice, and techniques. Eii trains you the latest techniques, with hands on training. You will learn the proper pressure, tips and skills in brow shapes, tips and skills on color, applying ink, making the ink stay, and many other hands on skills. Our classes include class supplies and Starter Kit. Our policy is SAFETY first. Advance your skills and learn the NEWEST techniques of Micro Blading in our 4 Techniques (Traditional Microblading, Hybrid, Powder, and 3D). Learn Basic Permanent Makeup ONLINE first, includes Traditional Brows, Traditional Eyeliner, Traditional Lips, Blood Borne Pathogens Training, Anatomy & Physiology, Machines, Needles, and more. Advance into Microblading Brows, with mapping the brows, techniques, and the latest skills to apply microblading. Price includes 5 or 6 days of hands on training and basic microblading starter kit. Does not include Permanent Makeup Kit or machine. Microblading Technique is done by hand. Basic Permanent Makeup is done with pen (machine). Our policy is SAFETY first. PLEASE NOTE: It is the responsibility of the client/student to check their state for all laws and licensing that pertains to their state. Eii is held harmless of any liability or responsibility.